If Your Computer Broke Down, What Would Happen To Your Business? Wouldn’t It Be Nice If Your Computer Support Company Answered Their Phone? When Computer Troubles Happen…Call Haxxess! Northern Ontario’s IT Company. Looking for Reliable IT Support? Managed IT Services Saves Your Business Money. 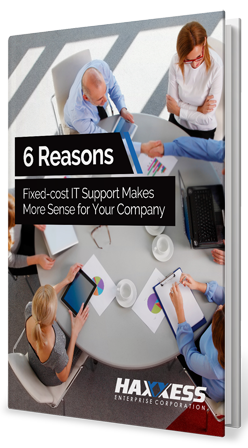 Fixed-Cost IT Support Cuts Costs By Up To 60%! Download Our Free Guide And Find Out The 6 Ways IT Managed Services Saves Your Business Money. Haxxess Enterprise Corporation and staff build a professional relationship with all our clients. We not only provide expert IT services but also learn our clients work procedures so we can help reduce their work loads and make them more efficient, and in most office environments we can introduce some type of automation task to increase efficiency. Working with Haxxess Enterprise Corporation brings businesses great advantages only previously available within large corporations. Our clients have full access to all our technical skills, training, resources and continuous development. Working with Haxxess Enterprise Corporation is not a cost, it’s an investment into growing your business, and all for way less than paying a single employee. Contact us at (705) 222. -TECH or info@haxxess.com for more information about our services and how we can serve your company. Crave Technology Information?Check Out Our Blog! We Are YouTube Stars! Check Out Our Videos.